There has been a lot of hand-wringing recently here in New Zealand about child poverty, citing the numbers of kids who go to school hungry, or with no lunch. The Opposition and the Church have joined an internationally driven campaign for higher wages, a ‘living wage’. But this campaign has some serious flaws in its New Zealand setting. Kev has already commented on this. Children in themselves have no power to earn, so child poverty always should point to the adults who have left the child in this position. As local Mayor Michael Laws calls it, ‘piss-poor parenting’. Here I agree with him whole-heartedly. People who call themselves parents should have the brains and the drive, as well as the sense of responsibiity for their offspring to feed them properly, and provide the bare necessities at least. No, it’s not a matter of too little money on the benefit. We are on National Superannuation with little extra, and we manage to feed and clothe everyone adequately. But this is because we do not waste our resources. I believe that much of the ‘child poverty’ in New Zealand is because of terrible choices made by parents – choices that involve spending scarce money on cigarettes, alcohol and gambling. This country has a really bad record for the normalisation of gambling, even in the kindergartens where the fund-raising raffle is an annual fixture. But there is another menace in the neighbourhood, that even further preys on poor families, this time targetting the Polynesian community in particular. There was a flyer put in our letter box yesterday, advertising loans – $1000, to be repaid at $50 per week, for 8 months. 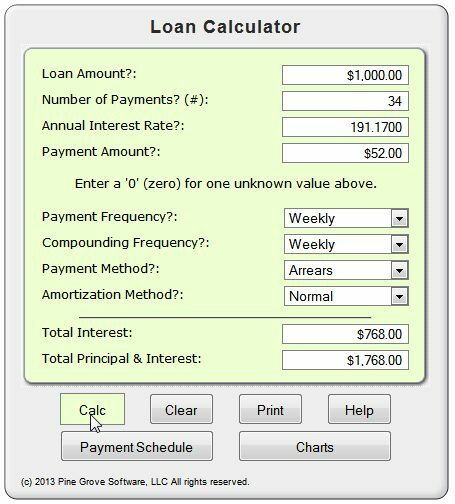 Loan Shark’s 191% Interest Rate. Do the calculations. This works out at 191% interest annnualised and even higher depending on compounding!!! This is so bad it’s incredible! The ad suggests that you might need money for car repairs, a holiday, funeral expenses, and also promotes its service of money transfer to the Islands. 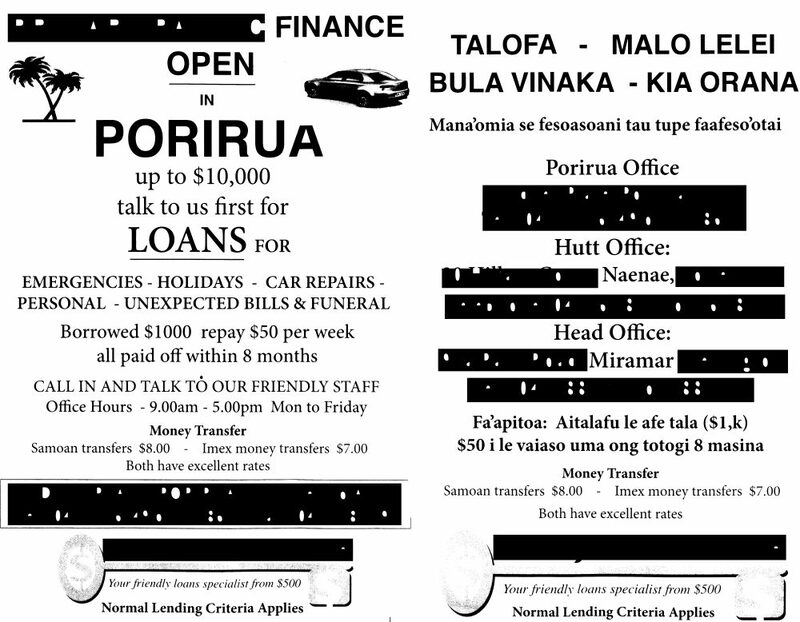 Our Polynesian people are being targetted – the cultural customs of contributing to each others’ needs for money will send many of these people to loan sharks like this one. Here is a place where the traditional Samoan falavelave just doesn’t work in the context of New Zealand living, with our wages and benefit rates, which have not been set with these cultural obligations in mind. No, we don’t have a problem with child poverty in New Zealand. We have a problem with parents making bad choices – placing concern for wider family ‘back home’ ahead of the little ones ‘at home’. And the loan sharks just step in to make it seem so easy. What can be done? These practices need to be widely talked- about, exposed, and high interest rates need to be prosecuted. Horrendously, in New Zealand, there is no longer a legal limit on loan contract interest rates; disclosure is all that is required before the bite. Cultural ideas that clash with living in New Zealand, especially if it leads to bad outcomes for children, are challenges our community leaders need to face up to. And our New Zealand way of turning a blind eye to excessive alcohol use and gambling needs to be seriously challenged at every level. This entry was posted in Justice, Kingdom living and tagged 191% Interest rate, benefits, child hunger, child poverty, cigarettes, cultural poverty trap, debt menace, drinking, falavelave, gambling, gaming, high interest loans, legal limits interest rates, living below the line, living wage, loan sharks, Michael Laws, Money Lenders, parental responsibility, piss-poor parenting, politics, Polynesian community, Social Justice Commission Aotearoa & Polynesia, The Credit Contracts and Consumer Finance Act 2003, the poor as prey by revfelicity. Bookmark the permalink.